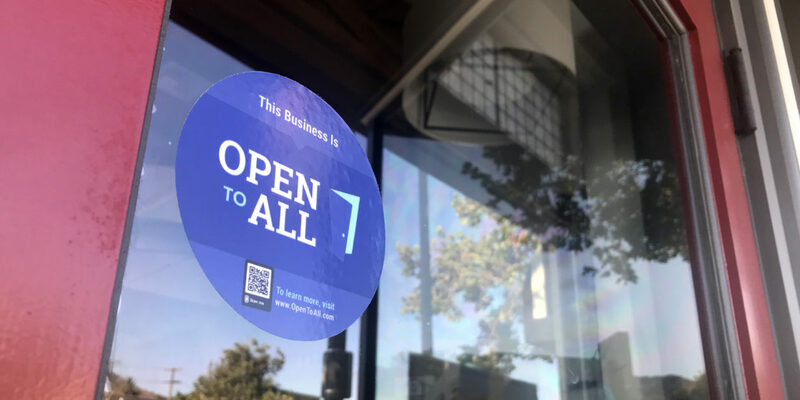 Small Businesses Against LGBTQ Discrimination is proud to be a member of Open to All, the nationwide public engagement campaign to build awareness and understanding about the importance of protecting people from discrimination—and to defend the bedrock principle that when businesses open their doors to the public, they should be Open to All. The Open To All campaign includes more than 190 racial justice, civil rights, LGBT, faith, health, disability, and allied organizations. Businesses large and small, including Yelp, Levi Strauss and Co., Lyft, Airbnb, and Thumbtack have signed the Open to All business pledge. President/Founder • Leonore Blitz Consultants, Ltd.
President • Ava S. Butler, Inc.
Director • Westport Marina, Inc.
Vice President • Linkage & Associates, Inc. Principal • Koda Consulting, Inc.
President/CEO • Oke-Thomas + Associates, Inc.
President • Solid State Alarms, Inc.
President/CEO • Eastern Time, Inc.
President and CEO • National Minority Business Council, Inc.
President • EGY Statistical Services, Inc.
CORONADO B & T Building Management. Happy Paws Pet Sitting Service, Inc.
Jeffrey R. Gilbert, P. C.
Law Office of Betty C. Resch, Esq. Law Offices of Rhonda Telford Naidu, P.C. Serroque Styles at Edmond Street parlor/ Ambience Hair Design & Nails LLC. The Cloak and Dagger Co. The Jewelry Box by M & T, Inc. The Villas on Holland, Inc.